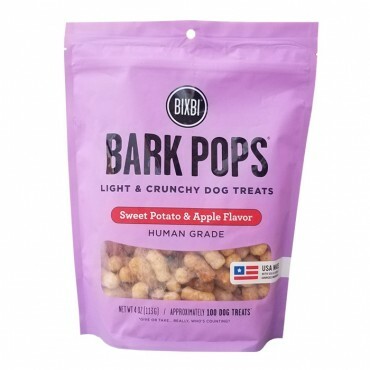 Bixbi Bark Pops are not your average cheese puff! Made in a human facility, these light and puffy treats aren't made with corn, they're made with a special blend of Pearled Sorghum, Rice and Navy beans. Perfect for training or treating your pups! Approximately 100 treats per bag! Made with non-GMO sunflower oil and real sweet potato! Pearled sorghum meal, rice meal, navy bean grits, sunflower oil, dried sweet potato, dried apple, maltodextrin, corn starch, cane sugar.